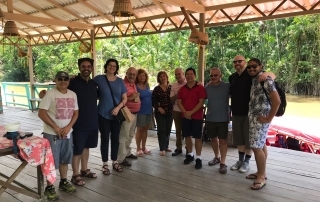 The WASBE Seminar held in Belém do Pará, Brazil, was a great experience, a true microcosm of what is possible through WASBE, and the perfect example of what WASBE is and should be about—making connections with people through band music, wherever that music is being made…even in the Amazon rainforest. Throughout the seminar there were vibrant performances, informative sessions, and great collegial interaction with our colleagues of stature, but also with Brazilian music students and future band directors. (Of particular note was the opportunity to reconnect with our Brazilian counterparts from São Paulo, Sadao Shirakawa and Monica Giardini.) Through this seminar WASBE was able to reach out into the local communities and hopefully make a lasting impact for good. 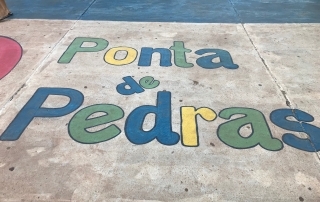 I personally had the enormous privilege of spending the majority of the week in Ponta de Pedras on the island of Marajó, working with the band of the Associação Musical Antônio Malato and their amazing director Marcelino Beltrão and WASBE board member and powerhouse Colleen Richardson from Western University in Ontario, Canada. It is always an incredible experience to introduce new repertory to hungry, young musicians, and when the repertory is international, well, it is an entirely new and exciting experience. The band’s director Marcelino is Mr. Music in Ponta de Pedras, and he does amazing work. Marcelino is underspoken and very humble. 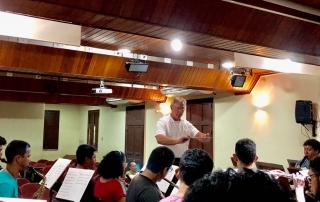 When you praise his work, he is quick to turn it to the work of the students and he enjoys updating you of the whereabouts of his students that are now studying at the Carlos Gomes Conservatory in Belém. It is a true sign of the effect music has on a person when they will take leave of their conservatory studies long enough to return by boat to the small town they came from to play with that community’s band and pay homage to their mentor, teacher, and friend. That perfectly sums up this regular occurence in Ponta de Pedras. WASBE board member Marcelo Jardim did a BRILLIANT job organizing this event. Parabéns, meu grande amigo! I hope that more WASBE members will take WASBE president Dario Sotelo’s “WASBE Seminar Initiative” seriously and that more of these great, localized events can spring up all over the globe. The week of rehearsals, masterclasses and seminars held in Belem in August was absolutely a wonderful success. 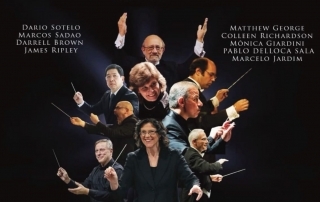 With a team of master conductors from North and South America, several wind band musicians and conductors from Brazil gathered together to learn, share, and make wonderful music which represented repertoire from around the world. I thoroughly enjoyed working with my colleagues, learning from them, and humbly shared with all involved that which I could. It was a true “WASBE” moment through cultural and musical exchange. Kudos to all involved! Traveling to South America for the first time, and being a part of our WASBE Seminar in Belem was an amazing experience on many levels. First of all, the performers who were a part of the Carlos Gomez Conservatory were so delightful to work with, and were able to put together a quite varied program of international styles within a very short period of time. The participants in the WASBE Seminar were also amazingly dedicated to learning as much as possible about music and music making from the clinicians. 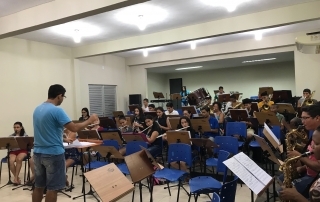 There were sessions on repertoire, rehearsal techniques, score study and non-verbal communication that all met with great enthusiasm. Having partners such as Matthew George and Dario Sotelo for our combined sessions made it not only more fun, but much more insightful as to how to “get the job done” while also being creative and flexible. Most importantly, the spirit of WASBE was highly in evidence with the camaraderie of those in attendance, the performers, organizers, and administration of the conservatory. This was a fine example of WASBE at its best, and what we can do to bring people together through music. Dario Sotelo’s and Marcelo Jadim’s WASBE Seminar in Belém (which was part of the VI Music of the Americas Festival), wonderfully epitomized the spirit of WASBE. Band enthusiasts from across the globe came together to make music, share ideas, and support one another. 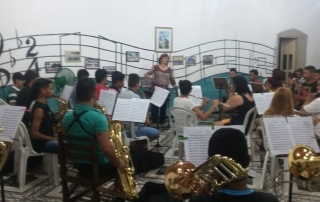 I had the great fortune to travel to Ponta de Pedras on the island of Marajó to work with the Antônio Malato Symphonic Band. The ensemble director, Marcelino Tavares, is inspiring. He does so many amazing things with very such limited resources. Due to his dedication and musicianship, the community makes sure that the music school gets what it needs. 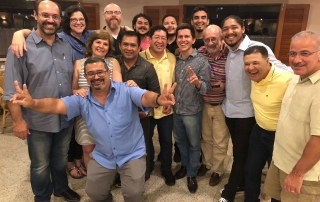 For instance, in order to ensure that all of the ensemble members would be able to travel to Belém for their Seminar performance, many community leaders made personal sacrifices. Some of the youngest performers had never been off of the island. So, this was a transformative experience for those young people. I would have to say, that seeing the community rally behind Marcelino and his initiatives, was also a transformative experience for me. I also had the great privilege of working alongside of Darrell Brown. It is always inspiring to watch other passionate music educators in action. However, what makes Darrell even more impressive is his humanity; it was moving to watch his interactions with the community and the ensemble members. Wow, he is a wonderful human being! Also, because nobody on the island spoke any English, he was tasked with translating everything for me. Thanks again my friend. Final comment, join WASBE and meet amazing people and hear repertoire that you have never heard before.